H-JUDAIC: Assistant or associate professor in Hebrew Bible/Old Testament Studies, Aarhus University. Follow the link for extensive further particulars and application information. The deadline for applications is 4 April 2019. The story of Joseph and Aseneth is a fascinating expansion of the narrative in Genesis of Joseph in Egypt, and in particular, of his marriage to the daughter of an Egyptian priest. This study examines the portrayal of Aseneth’s transformation in the text, focusing on three perspectives. How did Aseneth’s encounter with Joseph and her subsequent transformation affect various aspects of her identity in the narrative? In what ways do the portrayals of Aseneth, her transformation, and her abode relate to select metaphors and other symbolic features depicted in the Septuagint, the Hebrew Bible, and the Pseudepigrapha? And, how do the ritualized components through which Aseneth’s transformation occurred function in the narrative, and why are they perceived as effective? In order to shed light on these facets of Joseph and Aseneth, the author draws on the contemporary approaches of intersectionality, conceptual blending, intertextual blending, and the cognitive theory of rituals, using these theoretical frameworks to explore and illuminate the complexity of Aseneth’s transformation. Satlow on the "hasidim ha-rishonim"
MICHAEL SATLOW: THE HASIDIM HA-RISHONIM AND OTHER ANCIENT AND MODERN FANTASIES. Professor Satlow shares the abstract of his recent article in Historia Religionum. REMNANT OF GIANTS: Ephraim Nissan: Hebrew Anakim related to Greek Anakes. Maybe. If you're not clear about what that means, read on at the link. To avoid further confusion: it has nothing to do with Luke Skywalker's father. ANCIENT JEW REVIEW: The Perils of Polarization (Cynthia Baker). Although my work on the word Jew is never engaged by the authors (apart from an uncomfortable nod in an early footnote), it is clearly Jew that accounts for my invitation to contribute to this forum on a book devoted to Goy. I would be remiss, therefore, if I were to conclude my essay without at least some brief reflections on Goy through the lens of Jew. Another installment in the AJR forum on Ophir and Rosen-Zvi, Goy, on which more here. For lots of past posts on Cynthia Baker's Jew, including a Marginalia forum, start here and follow the links. ATLAS OBSCURA: Iraq al-Amir. Just outside of Jordan's capital lies an ancient castle and intriguing caves dating back to the Copper Age (bexly104). Nestled among hills just outside of Amman in Wadi Al-Seer is a quaint village filled with ancient stone secrets. Iraq al-Amir, which means “Caves of the Prince” in Arabic, is home to more than 10 caves that have been inhabited by various groups since the Copper Age, as well as the ruins of an Ozymandian castle. The site is also of considerable interest for Second Temple-era Judaism. I posted on it years ago here. Atlas Obscura is good at finding these interesting, out-of-the-way places. Atkins et al. on "Ben Sira Manuscripts after 120 years"
Ed. by Aitken, James K. / Egger-Wenzel, Renate / Reif, Stefan C.
The discovery of Hebrew manuscripts of Ben Sira in the Cairo Genizah has shaped and transformed the interpretation of the book. It is argued here that a proper appreciation of the manuscripts themselves is also essential for understanding this ancient work. Since their discovery 120 years ago and subsequent identification of leaves, attention has been directed to the interpretation of the ancient book, the Wisdom of Ben Sira. Serious consideration should also be given to the Hebrew manuscripts themselves and their particular contributions to understanding the language and transmission of the book. The surprising appearance of a work that was preserved by Christians and denounced by some Rabbis raises questions over the preservation of the book. At the same time, diversity among the manuscripts means that exegesis has to be built on an appreciation of the individual manuscripts. The contributors examine the manuscripts in this light, examining their discovery, the codicology and reception of the manuscripts within rabbinic and medieval Judaism, and the light they throw on the Hebrew language and poetic techniques. The book is essential reading for those working on Ben Sira, the reception of the deuterocanon, and Medieval Hebrew manuscripts. Cross-file under Old Testament Apocrypha Watch. H-JUDAIC: Conference: Land and Spirituality in Rabbinic Literature, Yeshiva University Center for Israel Studies, Mar. 3, 2019. Attendance is free, but requires advance registration. Follow the links for details and the program of papers. More on Professor Yaakov Elman is here and links. ARTIFACTS: Customs Letter About a Long-Lost Suitcase Leads to Artifacts from Desert with Early 'Jesus' Painting (Tom Metcalfe, Live Science). The ancient desert village of Shivta in southern Israel made headlines when archaeologists discovered a wall painting there that is thought to show the baptism of Jesus Christ, the earliest representation of Christ known in Israel. Now, they have found about 140 long-lost artifacts from the village, which showed up in an archive in Jerusalem, after they were left behind in a suitcase more than 80 years ago. This story was covered by Haaretz (premium) in January and I noted it here. But this one is available for free and it gives some new details about the artifacts. That's a nice photo of the ring with the gemstone carved with a whale. And follow the links from that post for more posts about the discoveries at Shivta, including the etching depicting Jesus' face at his baptism. Indiana University - Bloomington invites applications from outstanding scholars in the field of Hebrew Bible for the Alvin H. Rosenfeld Chair in Jewish Studies, an endowed Chair established to honor the founding director of the Borns Jewish Studies Program. The specific area of specialization is open, and scholars whose work examines the reception or interpretation of the Hebrew Bible in various historical and cultural contexts in the Second Temple through late antique period are encouraged to apply, though willingness and ability to teach courses on Hebrew Bible is expected. The ideal candidate’s teaching and research will complement existing program strengths. The position will consist of a joint appointment at appropriate rank in the Borns Jewish Studies Program and the Department of Religious Studies. Ph.D. or equivalent required. It is anticipated that the successful candidate will be in post either in August 2019 or January 2020. Review of applications will begin March 15, 2019. The review of applications will continue until the position is filled. Follow the link for further particulars and application information. RELIGION PROF: Pelosi and Proverbs. Further to Speaker Nancy Pelosi's favorite Bible quote, which isn't quite in the Bible. James McGrath relays the information that the Good News translation of Proverbs 14:31 is closer to her quote than anything else pointed out so far. WAIT, WHAT? Researchers hung men on a cross and added blood in bid to prove Turin Shroud is real (David Adam, Science Magazine). In an attempt to prove that the Turin Shroud—a strip of linen that some people believe was used to wrap Jesus’s body after his crucifixion and carries the image of his face—is real, researchers have strapped human volunteers to a cross and drenched them in blood. Most mainstream scientists agree the shroud is a fake created in the 14th century. That's right. And I doubt that this study is going to change that. Past posts on the Shroud of Turin are here and links and here. The starting point for any study of the Bible is the text of the Masora, as designed by the Masoretes. The ancient manuscripts of the Hebrew Bible contain thousands of Masora comments of two types: Masora Magna and Masora Prava. How does this complex defense mechanism, which contains counting of words and combinations from the Bible, work? Yosef Ofer, of Bar-Ilan University and the Academy of the Hebrew Language, presents the way in which the Masoretic comments preserve the Masoretic Text of the Bible throughout generations and all over the world, providing comprehensive information in a short and efficient manner. The book describes the important manuscripts of the Hebrew Bible, and the methods of the Masora in determining the biblical spelling and designing the forms of the parshiot and the biblical Songs. The effectiveness of Masoretic mechanisms and their degree of success in preserving the text is examined. A special explanation is offered for the phenomenon of qere and ketiv. The book discusses the place of the Masoretic text in the history of the Bible, the differences between the Babylonian Masora and that of Tiberias, the special status of the Aleppo Codex and the mystery surrounding it. Special attention is given to the comparison between the Aleppo Codex and the Leningrad Codex (B 19a). In addition, the book discusses the relationship between the Masora and other tangential domains: the grammar of the Hebrew language, the interpretation of the Bible, and the Halakha. The book is a necessary tool for anyone interested in the text of the Bible and its crystallization. S. C. Daley’s book, The Textual Basis of English Translations of the Hebrew Bible, moves us beyond existing uncertainties about the textual basis of modern Bible translations to a fresh understanding of the text-critical constitution of well-known English translations of the past four hundred years. Most translations depart from the Masoretic Text selectively, and in-depth analysis of their textual decisions leads (1) to the identification of distinct periods in the textual history of the English Bible, (2) to a classification of the translations by eclectic type, and (3) to the observation that each translation is ultimately unique from a text-critical perspective. The study then revisits the topic of the text to be translated in Bibles intended for the wider public. BRYN MAYR CLASSICAL REVIEW: Wouter Henkelman, Celine Redard (ed. ), Persian Religion in the Achaemenid Period. Classica et orientalia, 16. Wiesbaden: Harrassowitz Verlag, 2017. Pp. 496. ISBN 9783447106474. €98,00. Reviewed by Zachary W. Silvia, Bryn Mawr College (zsilvia@brynmawr.edu). Persian Religion in the Achaemenid Period presents the proceedings of a 2013 colloquium concerned with religion in the Achaemenid Persian Empire. Twelve articles are included, drawing together perspectives from archaeology, art history, Avestan scholarship, history, and philology. The book is primarily concerned with regions east of the Zagros Mountains and southern Central Asia and thus will appeal to scholars and graduate students in fields related to these geographic regions during periods of Achaemenid and Hellenistic contact. I noted the publication of the volume here. It doesn't have anything specifically on ancient Judaism, but many of the articles are of considerable background interest for Zoroastrianism and Achaemenid religion. There is also coverage of the Persepolis Fortification Archives and Persian-era Bactrian Aramaic texts (Aramaic Watch). BIBLE HISTORY DAILY has a two-part series on Judith by Robin Gallaher Branch. It was originally published in 2012, but I missed it then. Judith: A Remarkable Heroine. The first half of a two-part Bible History Daily presentation of Judith. Judith: A Remarkable Heroine, Part 2. The second half of Robin Gallaher Branch's two-part Bible History Daily presentation of Judith. The Book of Judith’s truly remarkable heroine, Judith, introduced as a devout, shapely, beautiful and wealthy widow (Judith 8:4, 7), exhibits characteristics showing her the equal of Israel’s finest warriors. Indeed her beheading of Holofernes, the invading Assyrian general—in his own tent, with his own sword, and surrounded by his own heretofore victorious army, no less!—marks her as a political savior in Israel on a par with David. ANCIENT TECHNOLOGY WATCH: How Was Iron Smelted in Ancient Israel? Researchers Build Kilns to Find Out. The transition from the Copper Age to harder iron tools was a turning point for the ancient Hebrew kingdoms, but we don't know quite how they did it (Nir Hasson, Haaretz premium). However, there are only so many ways the people in Judah and ancient Israel could have generated temperatures high enough to extract the iron from ore, and last week Dr. Adi Eliyahu of Ariel University set out to recreate the long-forgotten process. Using the means that could have been available at the time and common sense, Eliyahu – who studied chemistry and archaeology at the Weizmann Institute in Rehovot – and her colleagues set out to make iron the old way. We do indeed have several texts which seem to come from monasteries or monastic cells, although many more have no clear provenance, and, as we saw in the case of the ancient town of Kellis, there are some Coptic magical texts which we know were not produced or used by monks. This week, though, we will look at one of the best attested instances of a monk practicing magic, the fascinating case of Phoibammon of Naqlun. Using scriptural texts as amulets was therefore a way of drawing the sacred power of the Bible into the lives of individual Christians. While they might not be able to afford a copy of the Gospels in their entirety, they could wear their first lines as a way of warding off evil and misfortune. 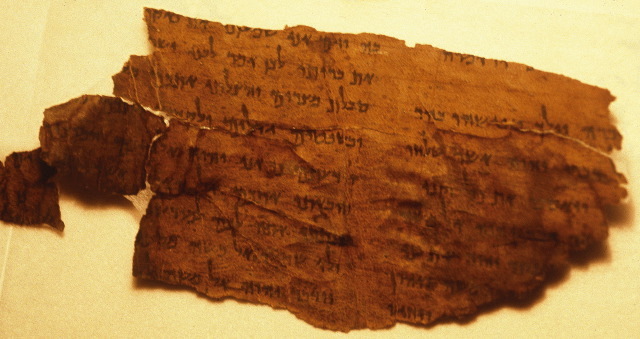 This use of sacred texts was not uniquely Christian – we have evidence of Greek speakers in Egypt using passages from Homer in amulets and other magical contexts, while evidence from the Dead Sea scrolls and Cairo Genizah shows that Jewish communities were using the Psalms as a form of protection from evil spirits before Christianity began, and continued to do so even after Christians appropriated their scriptures. Indeed, since the first Christians came from the Jewish community, it is likely that the amuletic use of scripture among Christians was at least partly inspired by its use in Judaism. The most common Psalm found in amulets, Psalm 90, is the same one which we often find in Jewish contexts. Also, did you know that Shenoute once punched Nestorius for disrespecting the Bible? AJR forum on Ophir and Rosen-Zvi, "Goy"
ANCIENT JEW REVIEW: Goy: An AJR Forum. Why Goy? (Adi Ophir and Ishay Rosen-Zvi). DAY CONFERENCE AT ST MARY'S TWICKENHAM, LONDON: The Dead Sea Scrolls and Ancient Media Culture. On 7 June 2019. Looks like a great lineup of speakers. They are accepting paper proposals. How to Judge Robert Alter's Landmark Translation of the Hebrew Bible. Finished after decades of labor, this one-man English translation is a stupendous achievement. How does it hold up against the masterpieces (and follies) that have come before? (Hillel Halkin). Reading the Bible as literature—if that is all we read it as—remains an act of rebellion today, if not against a divine giver of the Bible who no longer commands our credence, then against the Bible itself, which does not wish to be read in this way. It is regrettable that, in his excellent introductions to, and commentaries on, the literary qualities of the books of the Bible, Alter has not dealt with this issue, which is ultimately a translator’s as well. Perhaps he still will. What It Means to Read the Bible as Nothing More than Great Literature. Like all of the other methods that have been devised for approaching the Bible, the literary method has its inevitable limitations (Jon D. Levenson). Another difficult point, however, is in what sense the Bible can be said to wish or not to wish something. Does a book have will or desire? Is there any reason to take any voice within a book, however insistent it may be, as normative for interpretation? Is the Alter Bible Jewish, in Some Definable Sense? Robert Alter himself conspicuously does not call his own version Jewish in any way. Can we? (Leonard Greenspoon). Nonetheless, Jewish it is. This may become clearer if we look at it from the outside, as it were—and in particular at the criticisms leveled by John Updike at Alter’s translation of the Torah, The Five Books of Moses, published separately in 2004. Remember, Mosaic only gives you full access to three articles per month without a paid subscription. This uses up all three, but they are three good ones. For past posts on Alter's translation of the Bible, start here and follow the links. "Daphnis and Chloe in the Garden of Eden"
BIBLE HISTORY DAILY: Lovers’ Tale. A closer look at Daphnis and Chloe in the Garden of Eden. In “Daphnis and Chloe in the Garden of Eden” in the July/August 2013 issue of Biblical Archaeology Review, Theodore Feder explores how a second-century pagan love story alludes to the Biblical tale of Adam and Eve. In this post, delve deeper into the story with passages from the pagan romance, their Biblical counterparts and images of artistic representations of the lovers and their idyllic garden. Noted belately for Valentine's Day. For more on ancient Greek novels (not including Daphnis and Chloe) see here. THE ANXIOUS BENCH: The Forgotten Temple (Philip Jenkins). Not forgotten, of course, by PaleoJudaica and its readers. It is intrinsically likely that Leontopolis should have been a prime creative center. As I said, it had the skilled literate people on staff and in the neighborhood, and moreover it was close to Alexandria. Can any of the texts we know have come from there? Some fun speculation follows. Add to it Gideon Bohak's proposal that Joseph and Aseneth is connected with the priesthood of the Leontopolitan temple (mentioned here). Some other past posts on the Jewish temple at Leontopolis in Egypt are here and here. Review of Linguistics & Biblical Exegesis (ed. Mangum and Westbury), plus a blog series on Acts. READING ACTS: Book Review: Douglas Mangum and Josh Westbury, eds. Linguistics & Biblical Exegesis (Phil Long). While we're here, I should note that for some time Phil Long has been posting a detailed exegetical series on the Book of Acts, appropriately for a blog called Reading Acts. He is up to chapter 10 at the moment. If Acts interests you, do go and have a look. PUNIC WATCH: Underwater Archaeologists Find Surprising Artifacts from Major Roman Naval Battle (Owen Jarus, Live Science). Archaeologists exploring the site of a naval battle fought 2,200 years ago between Rome and Carthage have uncovered clues to how the battle may have unfolded — as well as several mysteries. The finds suggest that Carthage reused captured Roman warships during the battle and that Carthaginian sailors may have thrown cargo overboard in a desperate attempt to help their ships escape the Romans. The new finds fit well with what we hear from Polybius. He says that in a previous naval engagement at Drepana the Carthaginians had captured many Roman ships (1.51). And the Roman fleet took the Carthaginians by surprise at the Battle of the Aegates. The Carthaginians ships were deployed hastily and overloaded, while the Roman fleet was streamlined and well prepared (1.60-61). Both naval engagements took place during the First Punic War. It's always exciting when archaeology connects up in a coherent way with ancient literary accounts of an event. Every so often I like to mention again why "Punic Watch" is a feature of PaleoJudaica. Cross-file under Maritime (Marine) Archaeology, on which see also the posts collected here and here. BIBLIOGRAPHIA IRANICA: On Dating Biblical Texts to the Persian Period. Notice of a New Book: Bautch, Richard J., and Mark Lackowski (eds.) (2019). On Dating Biblical Texts to the Persian Period. FAT 2.101. Mohr Siebeck. Follow the link for a description, TOC, and ordering information. AUDIO: Archaeologist Unveils Mosaic Art Hidden In Ancient Israel Synagogue (Sandra Averhart, WUWF88.1, NPR for Florida's Great Northwest). Dr. Jodi Magness as been directing excavations in the ancient village of Huqoq in Israel’s Galilee, where crews discovered mosaics depicting biblical scenes and the first non-biblical story ever discovered decorating an ancient synagogue. Sandra Averhart talks to Dr. Jodi Magness, an archeologist and scholar of religion. She will be speaking in Pensacola Sunday, Feb. 17 about her research team's discovery of mosaics in an ancient synagogue in Israel. For past posts on the Huqoq excavation, its ancient synagogue, and its splendid mosaics, start here and follow the many links. BIBLE HISTORY DAILY: Abraham and Lot in the Bible. Examining ancient Jewish interpretations (Megan Sauter). Dan Rickett investigates ancient interpretations of Lot’s character in his Biblical Views column “Safeguarding Abraham,” published in the January/February 2019 issue of Biblical Archaeology Review. He shows that ancient interpreters frequently painted Lot as greedy and unscrupulous—a foil to Abraham’s righteousness. As usual, the full BAR article is behind the subscription wall, but this BHD essay gives you a summary of it.